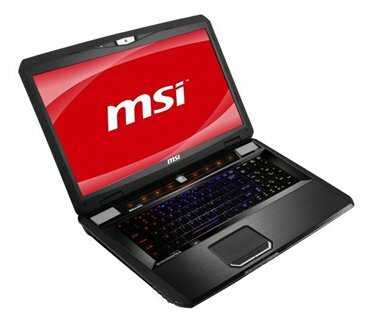 MSI introduced a new 17.3" GT780 gaming laptop with Intel's Core i7-2630QM quad-core processor and the NVIDIA GeForce GTX 560M graphics card. The system offers up to 16GB DDR3, 1920 x 1080 or 1600 x 900 pixel resolution, up to 750GB HDD + 120GB Intel SSD, Blu-ray or DVD burner, two USB 3.0 ports, two USB 2.0 ports, HDMI, memory card reader, 802.11b/g/n WiFi, Bluetooth 3.0+HS, HD webcam, and a 9-cell li-ion battery. MSI introduces its new generation GT780 notebook computer designed for the extreme gamer. It features Intel's second generation Core™ i7-2630QM quad core processor, the nVidia GeForce GTX 560M with four DDR3 memory slots, and accelerated dual hard disk architecture. In addition, MSI worked with SteelSeries to design a keyboard for the GT780 specifically with the serious gamer in mind. Taipei—MSI has finally rolled out the GT780—the dream machine long awaited by gamers worldwide. It packs the Intel Core i7-2630QM quad-core processor with core speeds of 2.00GHz and nVidia's new generation GeForce GTX 560M discrete graphics card. It boasts 1.5GB GDDR5 of high-end, large-capacity display memory for superior performance that greatly enhances game realism for the ultimate gaming experience. Eric Kuo, associate vice president for global sales, MSI Notebook, explains that the GT780 gaming notebook comes equipped with a gaming keyboard crafted by SteelSeries. It is not only much more rugged, the Windows Start key was relocated to the right side of the keyboard and the Ctrl and Alt keys enlarged to make it harder to strike the wrong keys in the heat of battle. The GT780's keyboard features the latest LED backlighting technology. Simply depress the Gaming Mode hotkey above the keyboard to light up just the left side of the keyboard. The rest of the keyboard remains dark, allowing you to find the gaming keys quickly when the bullets are flying. Intel® 2nd Generation Core™ i7 quad core processor: MSI's GT780 features Intel's most advanced Intel's 2nd Generation Core™ i7-2630QM quad core processor giving each core clock speeds of 2.00GHz. New generation Intel® Core™ i7 processors support Intel® Turbo Boost 2.0 which automatically allocates processor resources to boost core clock speeds and overall computer performance. nVidia® GeForce® GTX 560M discrete graphics card: The new generation GT780 pack nVidia's® GeForce® GTX 560M discrete graphics card with 1.5GB of GDDR5 display memory. They also feature large-capacity GDDR5 high-speed display memory coupled with nVidia's powerful display core, and DirectX 11 support for better detail in games. 16GB of memory: The new generation top end GT780 gaming laptop features four DDR3 memory slots for up to 16GB of memory. It also comes with RAID-0 dual hard disk architecture which not only doubles hard drive memory capacity, it enhances read-write speeds by some 70%. TDE technology: The GT780 uses MSI's own Turbo Drive Engine (TDE) technology, so just one touch of the luminescent Turbo hotkey located above the keyboard instantly revs up performance. It also has MSI's own powerful Cooler Boost technology, so again, just one touch of the luminescent hotkey above the keyboard kicks in the powerful cooling function to rapidly reduce system temp to enhance system stability. Windows function key relocated: Responding to cries from gamers, MSI got together with gaming equipment manufacturer SteelSeries to create a keyboard for the GT780. Not only is the keyboard more rugged, it has a more solid feel and the Windows function key has been repositioned to the right side to reduce the possibility of accidently striking it when you're hip-pocket deep in ogre blood. Larger Ctrl and Alt keys: Fans of FPS games need to use the Ctrl and Alt keys a lot for such commands as "crouch," "jump," and "pause," but these keys are smaller on most keyboards, making it easier to punch a nearby key by accident when you're going for one of them. With this in mind, the Ctrl and Alt keys were enlarged on the GT780. Executes 10 commands at once: Most keyboards aren't designed for gamers and don't respond readily to key combinations, adversely impacting combat capabilities. This doesn't happen on the GT780, because its gaming keyboard allows you to execute 10 commands simultaneously, enabling you to stay ahead of the game by rapidly accomplishing several missions concurrently. Backlighting for the task at hand: The GT780 lets you choose from among five keyboard backlighting scenarios—Normal, Gaming, Wave, Breathing, and Dual Color. Gamers will also appreciate the fact that the frequently used keys W, A, S, D, and Ctrl are all backlit on the GT780, using the latest backlighting technology. Simply depress the Gaming Mode hotkey at the top of the keyboard to light up the LED backlighting at the bottom left side of the keyboard. The rest of the keyboard remains dark, so you can find the keys you need quickly even in the middle of a white-hot battle. Space Ship inspired exterior: In the creation of the GT780, MSI was inspired by design concepts found in space ship. The elements incorporated into the overall design and every detail of this machine serves to give these high-performance gaming machines a feeling of professionalism and style. The glowing white letters "MSI" in the center of the cover accentuate the aluminum manganese alloy body's brush metal finish, placing this NB in a class all its own. What you get is a chic high tech texture that exudes awesome power and envelope-pushing style. Top theater sound technology: To enhance sound performance, MSI joined forces with world renowned sound designers at Dynaudio to study the GT780 meticulously. Even speaker locations and sound field design were calculated with precision. The two firms worked side by side to carry out vast amounts of study and countless calculations to determine ideal locations to install speakers to obtain obstruction-free sound transmission. MSI also worked closely with sound design specialists at Creative to incorporate cinema-grade THX TruStudio Pro wrap around sound which reproduces crystal-clear sound regardless of source. Full HD display: The MSI GT780 sports a 17.3-inch full HD screen and comes with Cinema Pro technology for a crisper picture and richer colors. It also has an HD720p webcam, so you can engage in clear, hiccup-free video conferences with friends and family anywhere in the world. Latest USB3.0 ports: The GT780 comes with USB3.0 which boasts transfer speeds of 4.8Gbps—10 times faster than USB2.0, so a 25GB HD film transfers in just 70 seconds. It also provides 80% more power for vastly faster charging speeds for external hard drives, flash drives, and other handheld electronic devices.